Shift Register LED Matrix Kit! Hot on the heels of my Arduino Nagios Display, I’ve made a kit version of the LED matrix that is much easier to assemble! It’s daisy-chainable, so you only need however many rows you want. 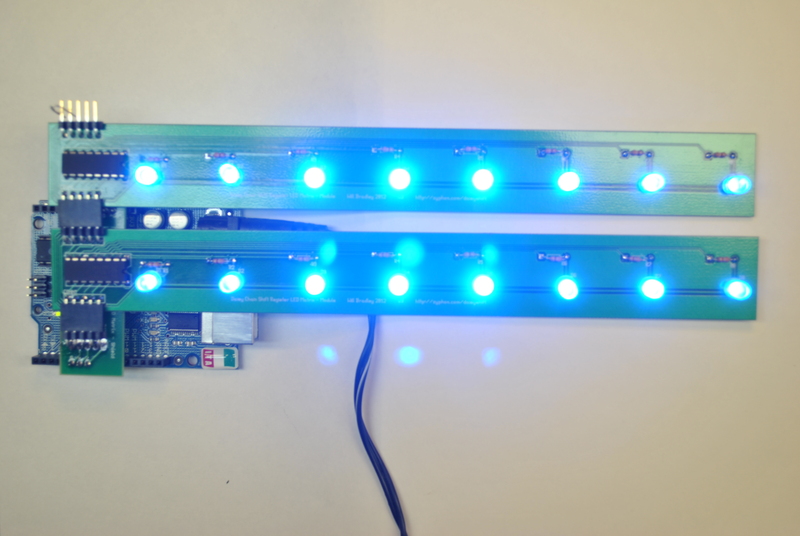 Perfect for workshops where you want to introduce someone to shift registers and LED matrixes but don’t want to buy 80 LEDs per student, while letting them take home something useful yet expandable. It uses the Arduino ShiftOut tutorial code with only slight modifications to the pin assignments. 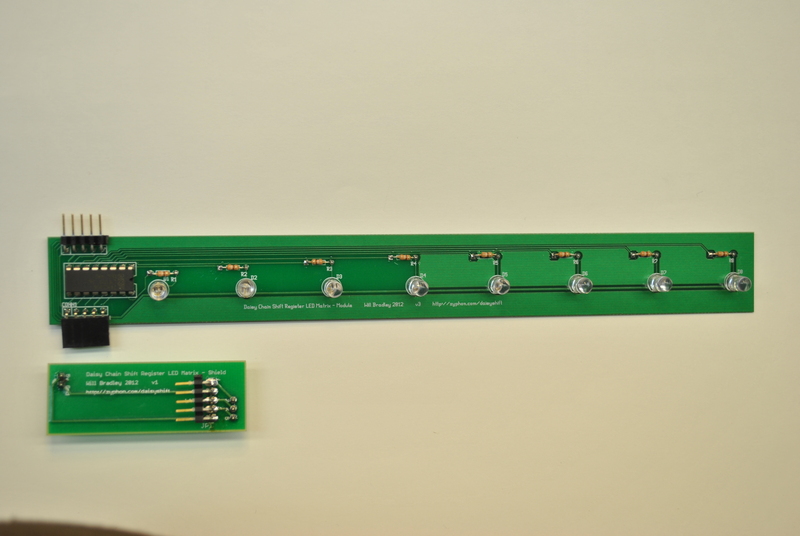 This allows the boards to be single-sided, meaning the traces are easy to follow for newbies to understand how everything works. It also allows the board to alongside an Arduino Ethernet with no pin conflicts. The basic kit includes one shield and one strip. 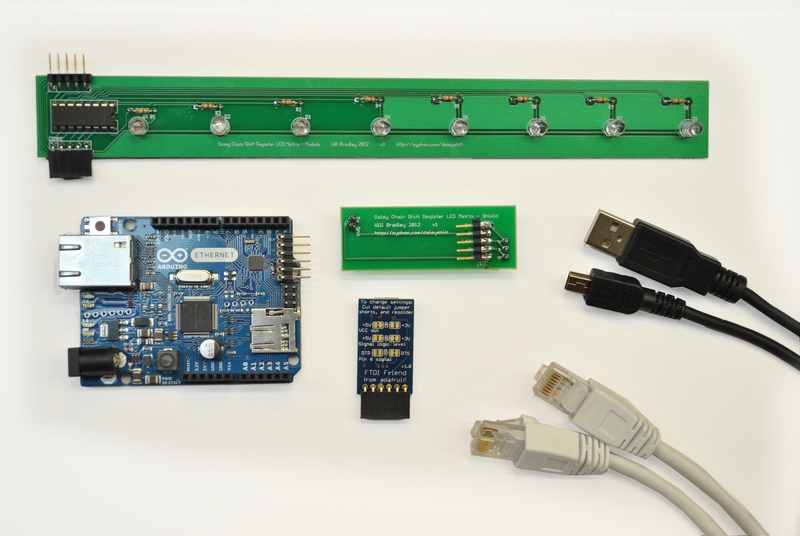 Additional strips can be added theoretically forever, but practically limited by the Arduino’s power supply, the shift registers, the circuit traces, and the characteristics of the LEDs and resistors. If you’re interested in buying some, check out my brand-new store! Would you be able to release source code and schematics of the board for enthusiasts out there learning arduino and shift registers? Sorry for my previous comment, I have found link to your github repository with DaisyShift kit project. thanks a lot!